On Saturday, December 19, 2009 hundreds gathered at Gladstone First Baptist Church to celebrate the life of David Henderson who passed away on December 9th after a battle with cancer. Dave and his wife, Sherie, served as missionaries in Indonesia and in Moscow, Russia and Dave also served on the European Ministry Team and assisted after the 2004 tsunami hit Indonesia. The Celebration of Life service involved many participants including music by Ronn and Peggy Pricer and family and Marcia Reavely and family. Pastor Scott Reavely delivered the Memorial Message on Dave's life verse, Psalm 84:6,7. 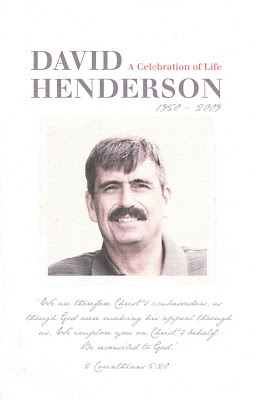 Dave Henderson is survived by his wife, Sherie, and their children Adriel, Paul, Anna, and Sean. Dave also leaves behind a legacy of a life well lived and is now in Heaven with his Savior.